I've been hunting for a kindly-made replacement for my husband's man bag - because his old leather bag has fallen apart - and of course that makes it a good time to explore newer, kinder options which are made without animal leather. 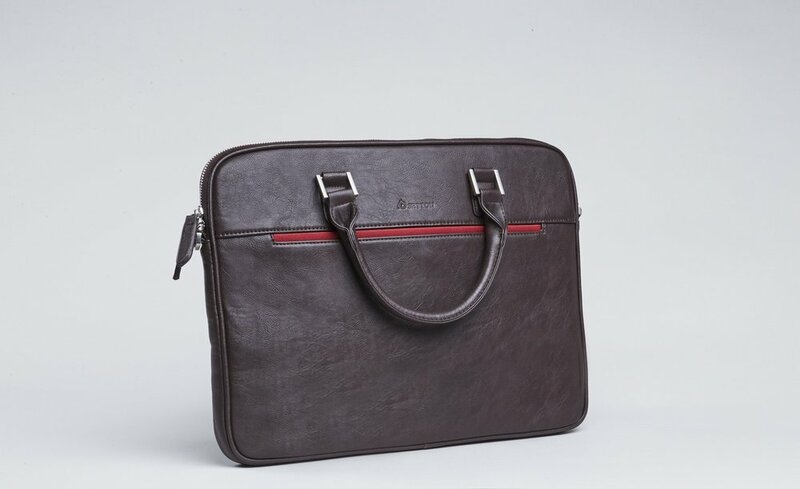 No 1: Designed to fit a 13 inch laptop, with a removable, adjustable carry strap, the Pintta Brown Slim Briefcase is made by Setton Brothers, who make a range of vegan gear for carrying work essentials. Like laptop sleeves, work style back-packs, and a decent range of man bags like this. Based in New York, the vegetarian brand donates a school bag for every bag sold to underprivileged children in Argentina (where the Setton Brothers originate from). No 2: A favourite brand of ours (both the boys and girls of the family) because Wills items just work. Simple as that. So I'm thinking that if this bag is as good as Will's shoes & boots, this one is a real contender. Made ethically in Portugal, this bag is made from rich grain micro vegan leather, and will fit up to 15 inch laptops. There's a back pocket for smaller items like transport cards or glasses, as well as an internal zippered compartment for a wallet or keys. With a foldover flap (which can be secured with the buckles, or quickly released via pulling against hidden magnets), a sturdy carry handle and an adjustable strap it can be worn cross body or carried in the hand. No 3: Designed for the smart urban traveller, Mad Rabbit Kicking Tiger (or MRKT) appeals to men with savvy style with an appreciation for the beauty of minimalism. Made from vegan materials, the body of the briefcase is tactile and sleek. Lined with waterproof vegan felt, the body is made from meta weave, a durable and flexible animal free material. The bag has a removable internal sleeve which will hold up to a 15 inch laptop, and a removable and adjustable shoulder strap. No 4: Smaller than the other contenders (fitting up to a 13 inch laptop) this Gotsu briefcase from Tokyo Bags is a really striking looking bag. I particularly like the feature sitiching around the buckle tabs - adding an elegant detail without being too fussy. It has a detachable, adjustable shoulder strap a well as top handles, and is made from vegan leather. It comes in all black, or black body with brown handles (which means it will go with either black or brown shoes: bonus points). No 5: The largest option of the list (and perfect for somebody who really does like to pack everything including the kitchen sink...ahem... not looking at anybody...) is this big boy from Canada's Matt and Nat. It holds up to a 15 inch laptop. With a top zipper closure (always a bonus for not losing things when the bag gets thrown sideways), a removable and adjustable strap and a large pocket on the back with a hidden magnetic closure, the Tacoma also has an interior zippered pocket and 2 interior slip pockets. Available in a (huge) range of colours, of course the black one jumps out to me for its timeless style. So it's a rather nice shortlist. Which one would you pick?